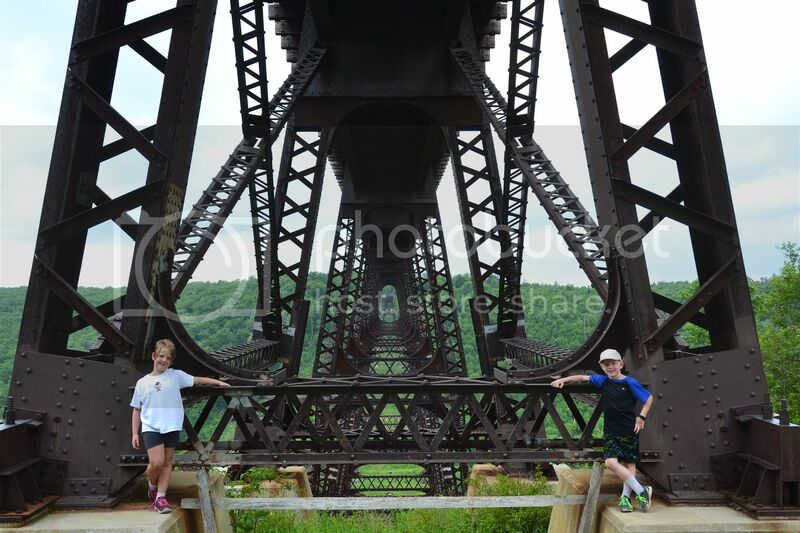 Have you been to Kinzua Bridge State Park? We went in June and it was beautiful. 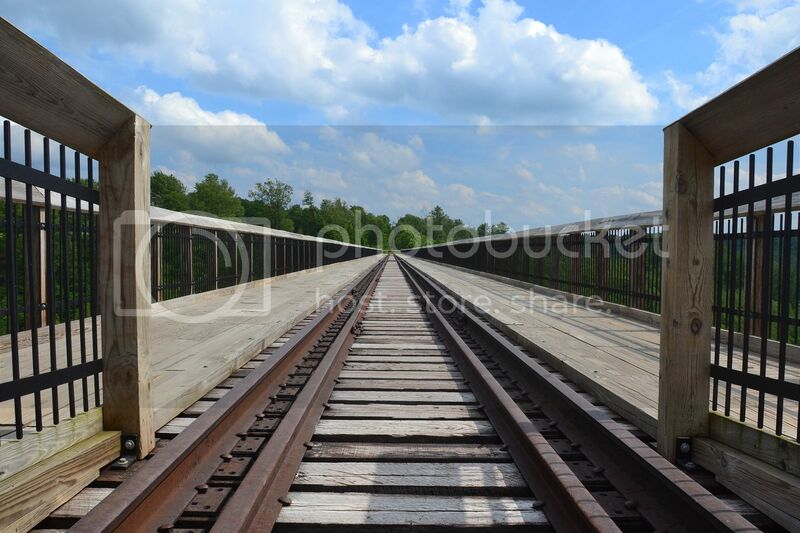 The Kinzua Bridge was once known as the longest and tallest railroad structure. It was partially destroyed by a tornado in 2003. It's been reinvented as a 600 foot long pedestrian walkway that allows you to look out to the gorge. 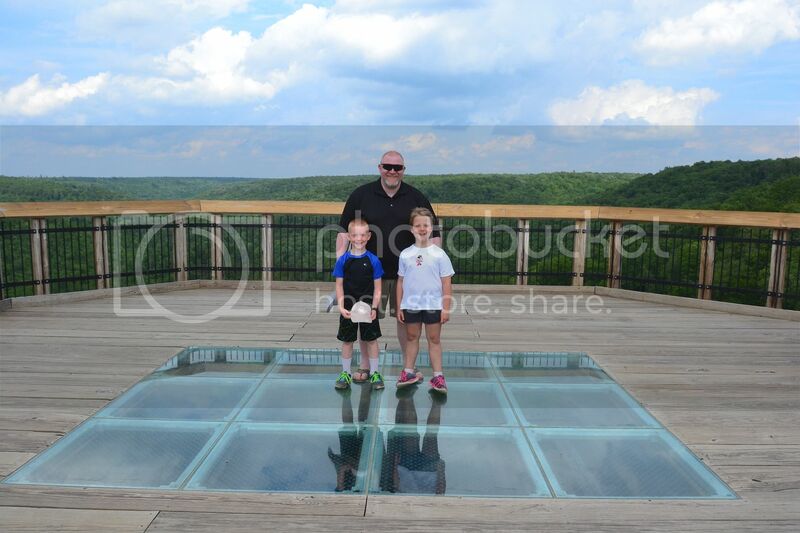 There is also a partial glass floor at the end of the walkway that you can stand on and look down to the bottom of the gorge....about 300 feet below you. They've left the rails on the walkway. From the end of the walkway, you see miles of the gorge. There are glass panes in the walkway you can stand on and look down to the bottom of the gorge. Twisted bridge pieces from the tornado that came through. There is a hiking trail that takes you to the bottom of the gorge. We could see parts of it from the walkway. We didn't have time to hike the trail because there was a storm coming in. We did walk just a bit of the trail to look at the underside of the bridge. 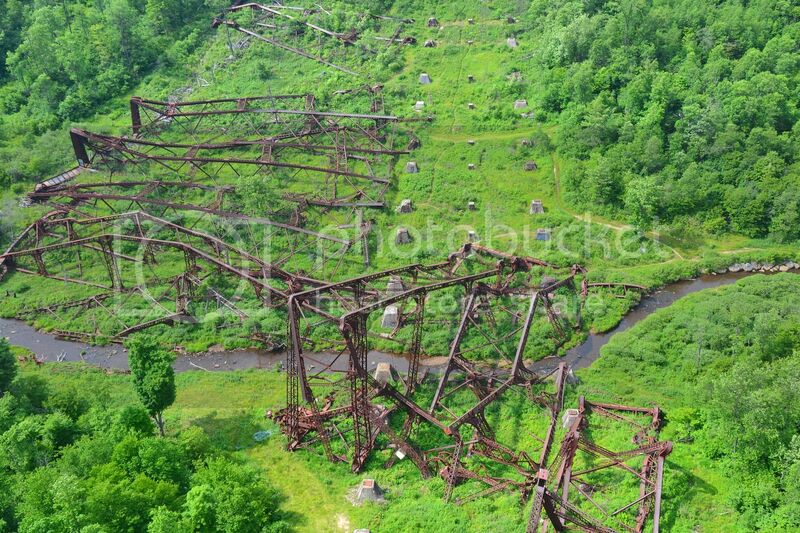 I have yet to make it to the Kinzua Bridge. I think its time to plan a trip soon! Last day of the year, light snow on the ground and time on our hands. After a series of "What you wanna do?" flying back and forth between Michelle and I we decided to load up in old Fafhrd and head over to the neighborhood state park, Oil Creek. Continuing along the hills our tracks mixed with those of the critters of the valley. Deer, rabbit,squirrel, fisher and coyote tracks crossed the trail and even followed along at times. Soon we climb up the hill towards the replica well derricks built above the flow of Oil Creek. The next day dawned even nicer, as we woke up on the first day of 2017. Seasonably warm (40 something degrees) temps and bluebird skies drew us from the house and once more into the woods. Today Fafhrd leads us over to State Gamelands 69 in a section commonly known as Black Ash..
A January thaw is upon us and with the ground being free of snow but the nighttime temps still low enough to keep the frost in the ground it makes for good hiking conditions. Today Michelle and I tossed some gear in Fafhrd yet again and headed Marianville way. A little over a hour from the house in Forest County, this little town is surrounded by the Allegheny National Forest. Just north of town is the Beaver Meadows Recreational Area comprised of a large pond (or small lake), marshlands and evergreen forests. Several hiking loops meander through this patch of woods but they can get wet and muddy in the wet seasons. Today would be perfect though, temps in the upper 20s and a bluebird sky. Towards the far end of the pond we kicked up a flight of ruffed grouse right before walking out to the floating boardwalk. Bobbing up and down as we passed, the boardwalk crunched the ice under it. Large patches of ice were crystal clear as well as the waters flowing under it. Than the trail started through some lowland hardwoods, the forest floor strip bare of saplings from the work of the neighborhood beavers. Continuing through pockets of spruce and open hardwood we find springs and seeps everywhere underfoot making us thankful for the invention of Gore-Tex. Back at the truck I set up a small propane burner and Michelle got to warming up some leftover cheeseburger chowder she made the day before for our lunch. We sat on the tailgate of old Fafhrd chowing down on warm all the while enjoying the unusually warm January sun and the quiet beauty of this area. It was a good day. After a week of wet weather and than a couple of sunny days I managed to convince Michelle to go on a waterfall hunt with me. Throwing some gear and victuals into our FJ Muninn we headed to the northern portion of the ANF in the Ludlow area of McKean County. Soon we were deep in the Tionesta Scenic Area churning gravel under our tires. Not only was the Falls spectacular but so was the holler it resides in. Boulders lay strewn and stacked up upon each other making for great scrambling opportunities. It was here all this time and I never knew it. But nowI do. When: September. Where: Clear Creek State Forest; Cook Forest Track; NW PA. Why: umm, got tired of working around the house and need some hiking boot time instead. About mid way on the loop you'll come to a parking area where multiple trail heads lead off into the woods. The main draw here is the Fire tower and as it is an easy hike this is where the main glut of weekenders will be. There's a decent view at the top, but it's better when the foliage is in full Fall splendor. Ah though, at the base of the tower, a rugged, steep and bouldery trial heads downwards through the mountain laurel, and the vast majority of weekenders turn around here and head back to their Subarus. For us we headed down the laurel lined trail and scrambled down towards the Clarion River below. Once down in the River valley the trail follows an old lumber tram line along the banks of the Clarion. Clear water, tall pines and hemlocks and the rustle and bustle of crickside wildlife sort of draw you along the trail. The hiking is easy once you get down here but the environs sort of get ahold of you and pull you along. Stumbling across the remnants of our local history is always a cool thing and made us glad for the occasional navigational mistake. Where: North Central PA, Elk State Forest. When: Independence Day. Why: Desperately needed time away from the grind. Our goal this trip was to hike the Fred Woods Trail just west of the town of Driftwood. We hadn't known about this trail but it popped up on one of Michelle's hiking apps one day and caught our interest. Pulling off from the main route State 555 we turn up Mason Hill road with the satisfying sound of gravel crunching under the tires. Having never run this road before we were enjoying climbing up the slopes of the Pennsylvanian hills as the wooded scenery swallowed us up. 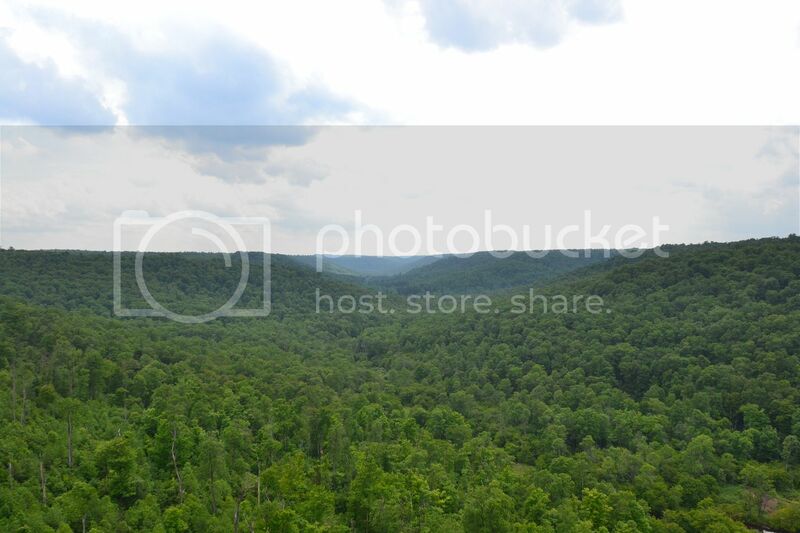 Simply a beautiful spot as you come out on a jutting finger of a hill with a 270* view of the Appalachian Mountains. Plans for a revisit when the leaves turn are already planned. But he was chill and so were we and we let each other be. It wouldn't be a Haggis' adventure without being photo bombed by a rattlesnake! I'm guessing from Michelle's calm smile that you didn't mention the additional guest until after the photo. Incredible scenery up there. Well I reached up and tugged her back by the arm without saying a word. Michelle has hung out with me enough to know not to argue when I give her the tug. The funny part is when we started this hike I told her to keep an eye out for rattlers as they are prevalent in this area...all I got for that was the eye roll. Well there ya go girl, listen to your ridgerunning man. This was Michelle's first rattler encounter in the wild and she thought it was pretty damn cool. After the hike and a burger down at the Benezette Hotel we stopped at the Elk Visitor Center. There we saw a section of Elk spine in a case...it was a match. One of the Park Rangers overheard our conversation and said she knew exactly where we found the remains. She called it in earlier this summer as a big Elk stag slipped off the top of the rocks and its antlers wedged in the crevasse and got suspended off the ground and its neck broken. Damn! She popped out her phone and showed us photos of the doomed Elk. The game commission came in after her reporting the incident and removed the head and antlers leaving the carcass lie. Which in turn made a great story for us to discover! It's still unclear if the elk commuted suicide or this was a case of murder. You dog... I have been reading about the Fred Woods Trail. Now I have to go. I love "rock cities". You should look at Bilger Rocks too. Not far from there. You dog... I have been reading about the Fred Woods Trail. Now I have to go. I love "rock cities". The trail is actually a 4.7 mile loop with 3/4 mile access trail. It's a bit rocky underfoot but it's a fairly level trail as it circles the plateau of the hills. You should look at Bilger Rocks too. Not far from there. With what little free time we find ourselves with these days we get out when we can. But luckily we don’t have far to go to get lost in big tracts of Pennsylvanian woods. One of our local hiking spots is the Kennerdale tract of the Clear Creek State Forest and a few weeks back we hit a part of the hiking trail network there that follow along the course of Dennison Run. The trail starts out through a mix of Appalachian hardwoods before entering into a valley of hemlocks. Having a wife that loves the outdoors as much as I do is a godsend. When I was a youngin’ my parents bought a large piece of property back in the woods. 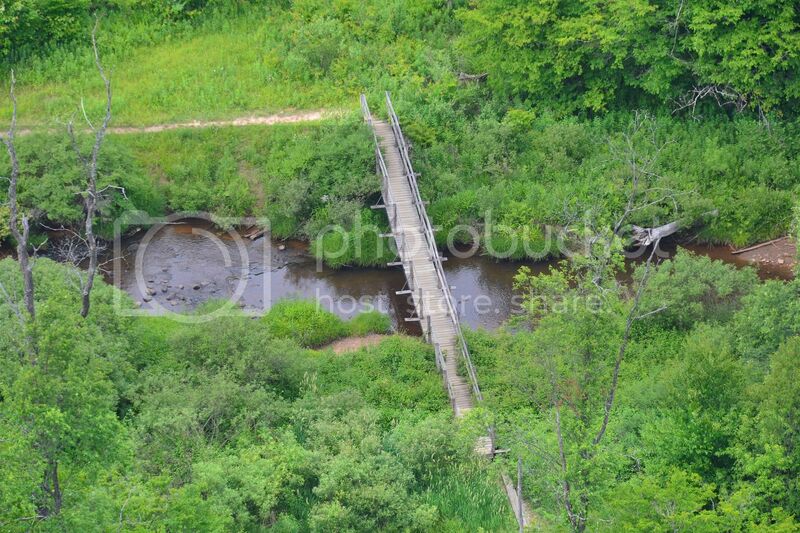 It was backed by 5000 acres of Pennsylvanian game lands and had a trout stream running through its midst. Here they made a permanent site for the old hand set Frick sawmill that was the start of our families sawmilling business. This was way before the giant automated mill we would eventually construct and to be honest funner and simpler times. As a lad of about 10 years or so this piece of land that we called “The Mountian” (it wasn’t really) would be a major influencer in my life. When I wasn’t working on the sawmill I was running these woods wild and free chasing critters, catching trout and letting my imagination run with the fantastic terrain our property and the surrounding game lands offered. Many a foe was battled in the rocks, forested glens and especially along the tumbling course of Panther Creek. Here is where I developed my love for the outdoors and for the hemlock hollers of my home state. But times moved on and we moved to a more civilized piece of land to build our big mill. There was no more time to run the hollers and play in the crick. Eventually my folks sold the property to one of my cousins whose property bordered the Mountain. And the grown man drifted away from the crick that raised him. A few more of Panther Creek.. These are amazing spots - as a PA boy myself I have similar places which I should go and visit. Thanks for the photos! You should look at Bilger Rocks too. And with those words we followed @Al Swope’s advice and rolled east shadowing the I-80 corridor along the back ways of the rural Pennsylvania countryside. Despite it being the start of January, the weather was mild and the sun shown down on us from a bluebird sky. Along with us was our son Cameron and his girlfriend Kimberly. We loaded up in my FJ, threw the camera gear and enough victuals to feed double our party took heed of Al’s recommendation. Soon we were traveling back a dirt road through Clearfield County farmland when we came upon Bilger park. We rolled out of the FJ and proceeded back into the hemlock grove that surrounds the rock formations here. Finding ourselves on the edge of a rocky break we peered down into the chaotic rock maze that is found here. Cracks and crevices run in all directions fir you too jump across or scramble up and down as you pass from one rock outcropping to another. Hemlocks and birches perch where they can while the mosses cling to everything. We made our way down into the pile and began to explore the maze of passages below. Kimberley being quite spritely cruised through them, for the rest of us it was a bit more of a squeeze in places. Thank you Al for a great idea, We spent a couple hours here mucking about until the Moshanon State Forest called us deeper into its midst.